Deputy Speaker, Jammu and Kashmir Legislative Assembly, Nazir Ahmad Gurezi Thursday instructed the Forest, BECON and Public Works Departments to conduct joint inspection for fixing up the aliment of Khandyal to Vijgali road in Tehsil Gurez.In this regard, he asked them to submit the report to the concerned quarters within a month to seek necessary sanction for early start of the construction work of the project.The Deputy Speaker was chairing a meeting of the officers of Forest, Public Works Department and BECON authorities convened to discuss and sort out various issues related to road connectivity in Gurez.The Deputy Speaker sought status of forest clearance of proposed raod projects, construction of tunnels and grant of permission for installation of crushers.Taking stock of pace of progress on Bandipora Gurez Chakwali road, the Deputy Speaker asked the Forest Department to complete demarcation of one hector forest land acquired by the BECON for the purpose within a week’s time. He also asked the BECON authorities to speed up the pace of work on the project and complete it in a stipulated time frame.It was decided in the meeting that the BECON will hand over the main road from Wonpora Bridge to Markote Bridge crossing to PWD and likewise PWD will hand over the newly constructed road from Wonpora bridge to Markote bridge up to Helipad to BECON for development and maintenance. About the development of road from Razdan Pass to Gurez, the BECON authorities informed the meeting that the necessary permission may be granted to install crusher machine. 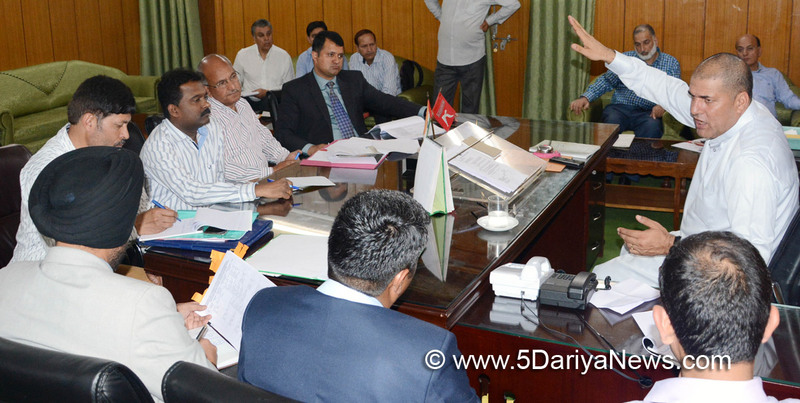 The Deputy Speaker asked the district administration Bandipora to issue necessary permission under rules at an earliest so that the construction work on the road does not suffer.The Deputy Speaker further directed the concerned to machdamize at least 15 km road length in Tehsil Gurez including Tulail upto Neeru during the current fiscal. He also asked them to construct bridge at Z-Kushi.Taking stock of the status of proposed construction of Bandipora-Gurez tunnel project, the BECON authorities informed the meeting that the centre government has given its nod for the project and necessary formalities are under process.It was given out in the meeting that improvement and upgradation of Athwatu to Bunkote - Sonarwani road project has been sanctioned under CRF at an estimated cost of Rs 15 crore.Meanwhile, the Deputy Speaker asked the Forest, BECON and R& B Department to work with utmost dedication, unison and ensure timely completion of all road projects. He also asked concerned to closely pursue the proposed road projects under Asian Development Bank and CRF forwarded to the centre government.The meeting was attended by the Development Commissioner Works, Satish Razdan, Chief Conservator of Forest, Abdul Gani, Additional Secretary Forest, Ecology and Environment, Mohammad Ashraf Hakak, Additional Secretary Forest, Special Secretary (Technical) Forest Department, K Raniesh Kumar, Cdr 32 BRTF, Col Amit Chander, OC 56 RCC BECON, Maj APS Khana, SE R&B Bandipora, Mushtaq Ahmad, Divisional Forest Officer, Bandipora and other concerned officers of Forest, PWD and BECON.